Recently rediscovered, the barreleye, also known as the spookfish, is most known for its unique tubular eyes. These eyes aid the fish in coordination in the dark and can pinpoint the bioluminescent nematocysts of various jellyfish. The dome over its eyes exemplifies biomimicry pertaining to the canopies of jet fighter planes. The main places it is found is off the coasts of California and the Pacific Ocean. It spawns by egg and sperm meeting together in water. They grow to be approximately 6 inches. The barreleye preys on various cnidarians and plankton and sometimes even steals food from other organisms! Otherwise, it spends its life motionless and in ambush, waiting for a snack. A barreleye fish's eyes are the most prominet feature with unique structure and use. Barreleye fish eat certain cnidarians, such as jellyfish. The barreleye exhibits biomimicry through the resemblance to the canopy of jet fighter planes. Short video surveying a barreleye in its natural habitat. ↑ Opisthoproctidae Wiki Species. Web. Accessed April 20 2018. Author unknown. ↑ Meet the Barreleye Fish Futurism. Web. Published November 12, 2013. Author Unknown. ↑ Barreleye Fish Animal Spot. Web. Accessed April 20, 2018. Author Unknown. ↑ McClain, Craig. 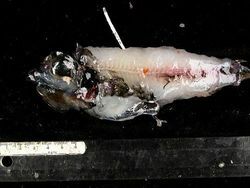 Scientists Solve The Mystery Of Why This Fish Is So Freakin’ Crazy Deep Sea News. Web. Published on February 23, 2009. ↑ Baidya, Sankalan. 30 Barreleye Fish Facts: It's Truly Bizarre Facts Legend.. Published October 17, 2017. ↑ Pacific Barreleye Encyclopedia of Life. Web. Accessed April 17, 2018. Author unknown. 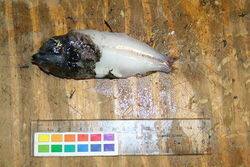 ↑ The Fish With the Transparent Head Twisted Sifter. Web. Published September 6, 2012. Author unknown.